Shin splints, or Medial Tibial Stress Syndrome (MTSS) to use the more medical term, is a common injury amongst runners. Like so many of the running injuries we see in clinic every day, shin splints is classed as an ‘overuse injury’. It does appear in other sports, but is certainly much more prevalent in runners. In typical cases of shin splints, pain is usually felt two-thirds of the way down the shin bone (Tibia), just off the inside edge of the bone. 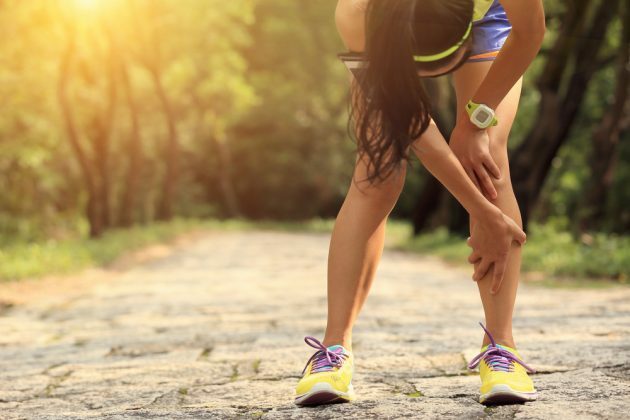 In the early stages of the condition, pain is usually felt at the beginning of a run and then normally subsides during the training session itself. Commonly, symptoms also tend to reduce a few minutes after a given run session has finished. So what exactly is going-on to cause the pain of shin splints? One group of suspects in this case, are the soft tissues of the tibia. The muscles of the calf and the smaller muscles of the ankle have their attachments along the tibia. Specifically, the tibialis posterior, flexor digitorum longus and soleus muscles, have been implicated as possible sources of injury. The theory being, that tightness, weakness, or excessive movement at the ankle of foot causes traction or tugging at the site of their origin on the tibia, leading to an irritation of the lining of the bone (periosteum). There is another soft tissue that does attach to the lower medial border of the tibia, in the location of the symptoms. That structure is the deep crural fascia (fascia is a thin sheath of fibrous tissue enclosing muscles and organs). This structure has deep insertions to the medial tibial border, finishing at the medial malleolus (inside ankle bone). It’s highly likely that the above mentioned muscles will be continuous with this fascia. Therefore, the deep crural fascia could tug on the periosteum, in the location of symptoms, and create the traction mechanism of injury detailed above. Some studies have suggested that smaller calf size, and decreased calf strength, could be connected with shin splints. The theory being, that it is the bone tissue of the tibia itself that is the source of pain. Bigger, stronger calf muscles encourage the tibia to become stronger, and therefore, able to take greater loading. Additionally, stronger calf muscles would be able to absorb impact forces directly, again taking the load off the tibia. This alternative explanation, again implicates the tibia itself. With this hypothesis suggesting that the problem arises via micro-trauma to the bone, due to repeated bending or bowing of the tibia. It is well known in engineering, that when you load a long, narrow structure (like the tibia) axially, e.g. place a force through the centre of the object, lengthwise, it will result in bending moments at the structure’s lowest cross-sectional area (the narrowest part). The narrowest part of the tibia is the distal third where symptoms of shin splints are commonly felt. It is generally suggested by biomechanists, that the tibia bends in the sagittal plane (forwards and backwards plane of movement) when running, placing most force at the distal anterior section of the tibia. But this of course depends on form; dictating where and how you strike the ground as you run. As they approach the jump, they plant the pole ahead of themselves (similar to an over-stride when running). Subsequently, we you see this big, anterior bowing of the pole. Great for pole vaulting but not so good for shins! If we factor in three potentially important elements, we see that this anterior bowing force, in many runners, will be shifted medially, to where the symptoms of shin splints are reported. As the foot loads, pronation occurs, (we all do it to varying degrees) which will shift the ground reaction force more towards the medial shin, and cause more of a side-bending force in the tibia. Pronation is usually coupled with medial rotation of the tibia, which also places more stress medially. When we run, we tend to land more towards the midline than directly in line with our hip. This is because it’s easier to get our centre of mass over our base of support. The consequences of this, are that our tibias will absorb the ground reaction force at an angle, and therefore a side-bending force, will again, be applied to the medial tibia, at the part of the tibia with the least cross sectional area e.g. where most people with shin splints have their symptoms. Additionally, the muscular contractions of our plantar flexors, namely soleus, can also cause a tibial bending moment. If you imagine the attachment site of soleus, at the top of the tibia, and its insertion at the calcaeneus (pictured left). As we go through mid-stance, and the soleus begins to contract to slow the acceleration of the tibia, the origin and insertion sites will be pulled towards each other, again causing an anterior bending in the sagittal plane. It is important to note at this point, that bone stress is not a problem, if it’s applied at a gradual rate. Bone is an organic and dynamic structure. Like all living structures in the human body, it responds to stress by remodelling itself, to ensure it can cope with the demands being placed on it. The problem comes, when the accumulated stress of training exceeds the body’s ability to remodel the area. This gives us an insight into why this condition is more prevalent in novice runners, or less fit runners, because their bones have not adapted over time to the stress of repetitive, high impact exercise. It also gives us another layer of evidence to illustrate that when it comes to injury prevention it is important to obey the law of adaptation, and accumulate the stress slowly, giving your body’s tissues the chance to adapt and get stronger. Another key factor is ensuring that you have strong pelvis stabilisers (Core muscles and glutes), good flexibility and up to date trainers. The goal of running re-education is to assess an individuals running style, and see if, through subtle changes to their biomechanics, you can shift the load from the painful area, whilst not jeopardising their performance or creating an environment for another injury elsewhere in the body. So in the case of shin splints, we are trying to reduce the anterior and medial tibial load. Here’s some of the running cues that I like to try with this condition. It’s important to note that there is huge variability in what works for different patients. Word of warning with these: If the cue is going to work for you, you should feel marked relief, and ideally no pain at all, within 30s – 1min of adopting the cue. If you’re not getting any relief by then, try not to run through it. If none of the below cues are working for you, then it may be time to book in with one of the Bristol Physio team for some advice. One of my most used running re-education cues across the board. The best way to do this is with the aid of a digital metronome (there are many phone Apps available). The theory behind increasing your cadence is to decrease an over stride, get you landing closer to your centre of mass and with a straight tibia, as opposed to your tibia flicking out ahead of the knee. As mentioned earlier this article, think of it a bit like a pole vaulters pole. As they approach the jump, they plant the pole ahead of themselves so you see this big, anterior bowing of the pole, great for pole vaulting but not so good for tibas! If you can imagine the pole vaulter placing the pole down vertically, and not ahead of themselves, you will see a poor pole vault, but also less anterior bowing of the pole, that’s what we are looking for – less anterior bowing = less force through the painful area. Trying to move the load from the medial shin, to achieve less side bending/tibial bowing. I try to bring about this change using a variety of cues. Generally, asking people to have some daylight between their legs or imagine running on either side of a yellow parking line, gets the right changes. The idea here is to decrease the amount of dorsiflexion (toes travelling towards your shin) the ankle goes through. Lessening dorsiflexion means less tibial bowing from the action of soleus, as it tries to decelerate the tibia as it moves into end of range dorsiflexion. Stiffening the ankle also helps to pretension the muscles, so they can work reactively and elastically. Good for speed but also takes the load of the bone itself. Again, we are trying to decrease the anterior tibia bowing. If we go back to our rubbish pole vaulter, as we discussed, if he places the pole out in front of him with forward and downwards force it will create anterior bowing. However, if he plants the pole down with a backward and downwards force, it will not bow anteriorly, but posteriorly. Bad for a pole vaulter, but good in our tibial context! i.e the force will go more through the back of the tibia. Any change in the direction of the ground reaction force, to a more backwards and downwards force, will decrease the load in the anterior tibia and may be enough for us to keep running without pain. To cue this, think of pushing your leg back and down in a backwards tick type direction, using your glutes to perform the movement. Often I’ll say paw back on the ground like a raging bull! And think of kicking your leg back and out behind. [See Mo Farah running above: look at his kick back and the degree of hip extension. This will automatically make him land on his mid-fore foot]. As mentioned earlier, weak calves have been implemented in shin splints. So seems like a good idea to strengthen these muscles as a way to create a stronger, thicker tibia, but also being able to take more load themselves. But remember to maintain your flexibility when strengthening by stretching post work out. Often a medial arch support works well to offload the medial tibia. Taping (and sometimes orthotics) can be great tools to offload an injured or sensitised area which physio’s will use to assist you in your rehabilitation. Bit of a weird one this, intuitively you would think that running on softer ground, such as an athletics track, sand or grass, would be easier on the legs, but the literature suggests that when we run on softer ground our leg actually stiffens more to compensate for the softness, and the reverse is true when running on hard ground i.e. less stiff legs. This has led many to suggest that it may be better for runners with shin splints to run on harder ground. I remember when I had my shin splints, I found it better running on softer ground, but might be worth bearing in mind if you find the pain is worse on softer ground. Cross-training can be effective at this point, to maintain strength and fitness. Remember you only need to offload the painful area, not your whole body. I will often suggest aqua-jogging which will allow you to work on technique and keep your running specific movement patterns with very little stress on injury.